It’s Sunday and I’m headed back home from the SPITS run. I have another party to attend on the east coast (Chesapeake Bay) and want to arrive there this coming Friday. I also need to swing by the house and pick up Karen for this trip. That demands more riding and less sightseeing. Rather than ride back the way I came, I need to make a little time. That means a more direct route and more slab through Utah and Colorado. I can get home from Denver in two days, so if I can get to (or past) Denver by the end of the day on Monday, I’m in pretty good shape. The plan is to take Carson Pass back through the Sierra Nevadas (nothing else is open yet) and then US50 across Nevada and Utah and weave around a bit to pick up I70 in Salina, UT. I’ll get to enjoy I70 through Utah and Colorado (if you have to slab it, these are hard to beat) and then retrace my steps back home on I80 and I94. For today, the goal was Salina, UT, but I already knew that was a serious stretch goal. Between packing up, Vina’s breakfast, and saying goodbye to everybody, I knew I wasn’t getting out of here until after 10am. I had nice, warm, sunny weather the entire day. I had the vents on the jacket open all the way through Carson Pass (though it did get a little cool at the top). I chose to take one scenic detour and took CA89 up to Lake Tahoe. Yes, it was busy and had lots of stop lights, it the photo opportunities outweigh the time lost. A few of a boat cruising around Lake Tahoe. The trip across Nevada on US50 isn’t for everyone. It’s very remote and not everybody can see the beauty in the desolation. I love it and ride it when I can. Today’s crossing was uneventful. The Nightowl’s bigger gas tank (when compared to the Cruiser and the Vector) afforded fewer gas stops. The miles-to-empty gauge said I had 12 more miles in the tank than was needed to reach Ely from Fallon, but I didn’t chance it and filled up in Eureka. One change in wind direction and that 12 mile safety factor could have evaporated. The sun was almost down as I approached the Utah border just west of the Great Basin National Park. The setting sun on the mountain faces made for some nice viewing. A mountain in the northern part of Great Basin National Park catching the last rays of the setting sun. The sun is almost gone as I travel US50 heading northeast around the mountains in Great Basin National Park. Sunset comes quickly in the mountains. One moment you’re in full sun, then the sun dips behind a mountaintop and you’re in complete shadow. This sunset caught me between Great Basin and the next range to the east. Once night set in, I had a good chance to test the new Clearwater Krista driving lights that I’d added before this trip. 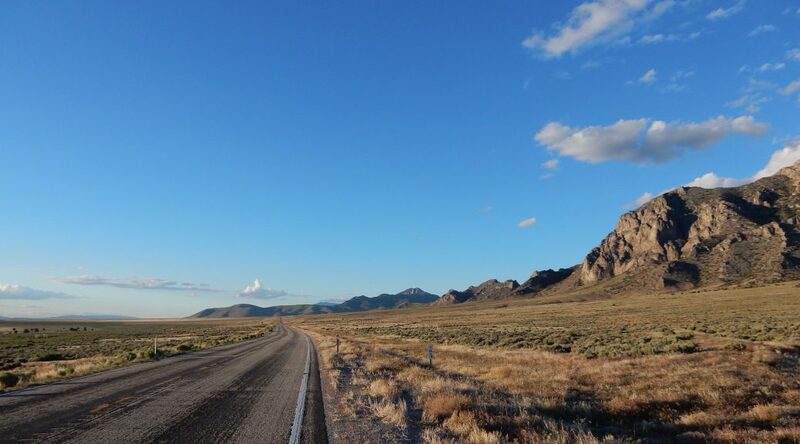 They are a seriously good thing and provide a much clearer view of the distant roadway, especially on long straight stretches like through the deserts in the western United States. One more note about traveling the US deserts: When you see the lights for a distant town, it takes you forever to actually reach that town. It seemed like I was riding towards the lights of Delta, UT for an hour. With the hour lost at the Utah border, I got into town shortly before 10pm. I was able to grab a quick room at a small strip hotel and proceeded to task across the street for a bite to eat at the only thing that was still open at 10pm on a Sunday night: McDonalds. Here are the route and altitude maps for the day. The route map also has an overlay of altitude. The route map for the SPITS Run day nine. The altitude map for the SPITS Run day nine.